Col. Richard White, Commanding, 55th Pennsylvania Volunteers (c. 1861-1865, public domain). Beaufort, S.C., October 26, 1862. SIR: In obedience to orders from your headquarters, in regard to the action of my command in the battles of October 22, I would respectfully report that after disembarking at Mackay’s Landing my command was assigned its place, being on the left of the First Brigade, Colonel Chatfield in command. In this order it marched for some miles, companies being detailed from time to time, with orders to report to Colonel Good, commanding the advance. Near Frampton the command was ordered up on double-quick, which was promptly obeyed. At this point it came under a very heavy and destructive fire of shell and canister from the enemy’s batteries. The order was received to form in column and advance; and, although the most of the command had never been exposed to a cannonade so severe and so sustained and men were falling rapidly from its effects, yet the order was executed with admirable promptitude and precision, the officers, with one exception, setting a noble example, which was imitated by the rank and file. The order was then received to get under cover for a time, while our artillery operated against the enemy’s guns. Then the order was sent to charge. Together with the Forty-seventh Pennsylvania Volunteers and Sixth Connecticut my command rushed in, and although the ground was exceedingly difficult, covered with a dense thicket, with a swamp in front, our men, with remarkable energy, at once overcame these obstacles, swept over the hostile position, and rapidly pursued the fleeing enemy. The pursuit was continued to Pocotaligo, where the enemy had again taken up a strong position, broken the bridge over the creek in his front, and while re-enforcements were arriving to his support opened a heavy fire of cannon and musketry. My command, having come up at the double-quick, was ordered into position on our left. In obedience to an order for two companies of sharpshooters to operate against the enemy’s batteries, Company A, under command of Lieut. D. W. Fox, and Company B, Captain Shearer, were thrown forward. These companies, well armed with good weapons, went in with the greatest enthusiasm and their deadly fire soon caused the enemy’s cannonade to slacken, and more than held their own in the contest with the enemy’s sharpshooters. This, being carried on at short range, was quite bloody. Company A lost among others Sergeant [Samuel] Herter, who was shot dead while taking aim, and its remaining sergeants, [Abram] Alstead, [Patrick F.] Hodge, and [Harry] Marlett, were wounded. These companies, having exhausted their ammunition, had to be relieve. First Lieut. D. W. Fox distinguished himself by the efficient manner in which he fought his men. Company K, armed with the Springfield musket, was sent up to relieve. It was well led by Lieutenant Saupp and Acting Second Lieut. H. W. Fox. The latter in particular behaved well. The loss in this company is one that will be felt. It includes First Serg. 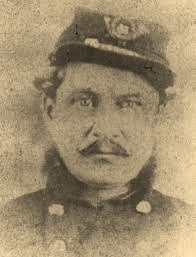 William L. Martin, who was shot dead, and Sergt. [G. E.] Leech, who was severely wounded. Company D, Captain Lyons, and Company E, Captain Bennett, were also ordered forward to support our battery, but being armed with altered smooth-bore muskets their fire could not compete with that of the enemy’s splendidly armed sharpshooters. They were brought off. These gallant men fulfilled every duty practicable to men in their situation. Company D fired as long as they could load their muskets, which after a few rounds became so foul that a cartridge could hardly be rammed down, and even then many of the cones were blown out of the seats. The experience of Company E in the matter of arms is the same as that of Company D. In the latter company the captain received a ball through his sleeve and four of his men were wounded. Captain Bennett, of Company E, a noble, chivalric young officer, beloved by his men, was killed on the spot, and two of his sergeants, W. Benseman and [George P.] Parry, were severely wounded. I trust that I am within the line of duty in respectfully claiming the attention of the general commanding to the fact that the usefulness of my command was limited by its armament. So far as it was equipped with rifles and Springfield muskets so far was it of account. I was compelled to withdraw gallant men and capital marksmen because the weapons they carried were worse than useless. True our bayonets might have counted for something, but that was the fault of the enemy, not ours. He did not wait to give us an opportunity to handle them. Late in the evening I was ordered to withdraw my command beyond the second line of defense and from there to Mackay’s Landing. This was accomplished in the best of order. My command remained there until all the troops had embarked, being the last to quit the spot. I think I would fail in my duty did I not express the gratitude of the command to the general commanding the whole expedition for the gentle and provident care exercised by him toward the wounded. The hardy soldiers have found a new tie of attachment to their leader. My second in command, Major Filler, manifested much bravery. Adjutant Metzger and Lieutenant George, regimental quartermaster, were of much use to me during the action. Adjutant Metzger manifested the qualities which should characterize the accomplished field officer, and both he and Lieutenant George were especially active in the transmission of orders and bringing off the wounded. With much respect, I have the honor to be, colonel, your most obedient servant. Colonel, Commanding Fifty-fifth Pennsylvania Volunteers. Commanding First Brigade, Tenth Army Corps. The War of the Rebellion: A Compilation of the Official Records of the Union and Confederate Armies. Prepared Under the Direction of the Secretary of War, By Lieut. Col. Robert N. Scott, Third U.S. Artillery, and Published Pursuant to Act of Congress Approved June 16, 1880, Series I, Vol. XIV. Washington, D.C.: Government Printing Office, 1885.